We strive to give you the best experience possible. No issues, but item is pre-owned, and may have slight signs of handling. This is to be expected. You must request an invoice. Lay-flat for easy storage. Zip down front panel for easy access to machine. Stabilizing strap to hold machine in place when in motion. Everything Mary Teachers Tote EVM-8864-4, RARE ZEBRA STRIPES/PINK INT. It has 1 large bag with 3 storage pouches on Exterior.Great price for this very stylish Tote Bag. NWT Everything Mary Makers Tote, Gray, White, Green. Condition is New. Shipped with USPS First Class Package. Scrap Paper Scissors Storage Case Positive Paisley Collection Organizer . Condition is New. Measures approximately 15x10x3. Color: Black. satin, nylon with silver trim. Two piece storage bag set for crafting. Everything Mary Desktop Tote, Purple Paisley. This tote has a coating for easy cleanup, and is made with durable polyester. Color: Purple Paisley. Holds sewing machines up to. INDUSTRY LEADING SCRAPBOOK STORAGE TOTE - The Rolling Scrapbook Storage Tote by Everything Mary is the industry leader in scrapbooking storage. Our Rolling Scrapbook Storage features 9 storage spaces with a roomy space for your papers, projects, scissors, or any other scrapbook supplies. Black Quilted Rolling Tote Stabilizing strap to hold machine in place when the tote is in motion. Case holds up to 16.5" x 9.5" x 13.5" sewing machines. Gender: Unisex. Zip-down front panel for easy access to machine. Sewing machines can travel in style in the Everything Mary rolling sewing machine tote. Holds machines up to 17 x 8 x 12.5in; includes safety strap. 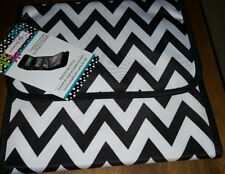 Everything Mary Deluxe Rolling Tote, Gray with Pink Trim. 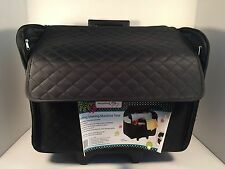 Everything Mary Black Quilted Rolling Tote:Case holds up to 16.5" x 9.5" x 13.5" sewing machines. Stabilizing strap to hold machine in place when the tote is in motion. Zip-down front panel for easy access to machine. 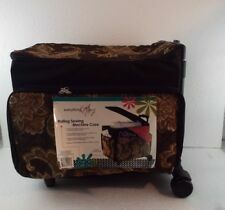 The Everything Mary Rolling Sewing Machine Tote is a great way to protect and travel with your sewing machine. Everything Mary Black Quilted Rolling Tote Stabilizing strap to hold machine in place when the tote is in motion. 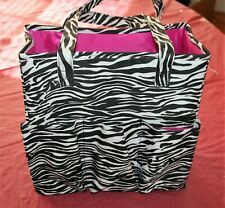 RARE ZEBRA STRIPES / Everything Mary Teachers Tote EVM-8864-4, PINK INT. Everything Mary Teachers Tote EVM-8864-4, RARE ZEBRA STRIPES/PINK INT. It has 1 large bag with 3 storage pouches on Exterior.Great price for this very stylish Tote Bag. Sewing Machine Case On Wheels Rolling Tote Carrying Luggage Travel Storage Carry PERFECT SEWING COMPANION - The Everything Mary Rolling Sewing Tote is perfect for all of you sewing storage needs., FITS MOST STANDARD MACHINES - Holds up to 16.5″L x 9.5″W x 13.5″H sewing machines, LOTS OF STORAGE - With multiple storage spaces and a large sewing machine storage space, finding space wont be an issue, INDUSTRY LEADING DESIGN - With an adjustable, telescoping handle and inline wheels, this bag is perfect traveling, MADE TO LAST - This tote is made with the end user in mind, and made with the highest quality materials, ensuring the best product possible Everything Mary Deluxe Rolling Tote, Gray with Pink Trim Sewing machines can travel in style in the Everything Mary rolling sewing machine tote.